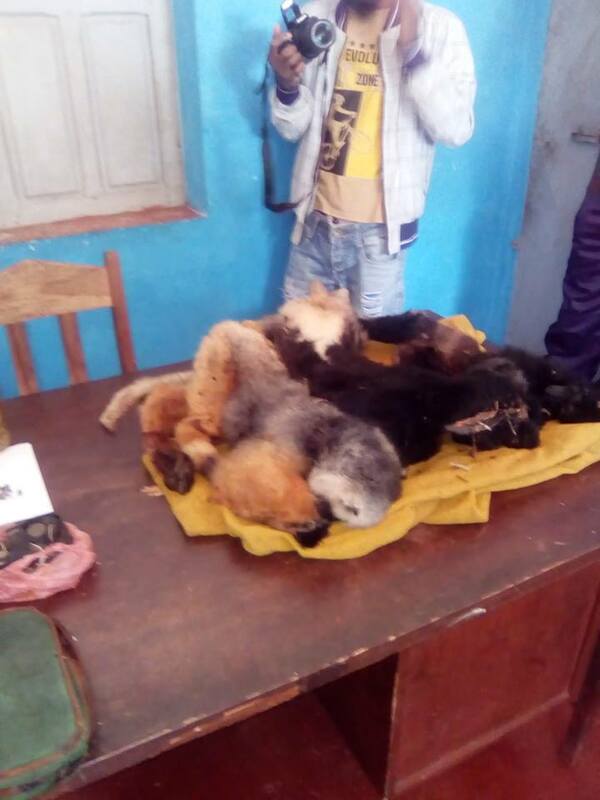 On Wednesday 28th of February in the Commune of Lakato, a lemur poaching tragedy was reported and shared through social media as well as the international news. The Gendarme and VOI Firaisankina caught and arrested a man with a bag of dead lemurs. Illegal hunting commonly known as poaching is one of the main drivers of biodiversity loss. Sadly, lemur poaching in Madagascar is pretty common for the commercial bushmeat trade and pet trade. While a group of people were patrolling the forest, they heard shots, and reported it to the VOI Firaisankina office at Andasibe. The officers and colleagues immediately started to follow the poachers’ steps. They arrived to the middle of the forest when they discovered that the poachers had built a hut where they found five dead bodies of Indris, as well as pots, spoons, arms, and tools for poaching. They were able to track down and catch one of the poachers. Sadly his accomplices escaped, but they are still looking for them. Still, weapons were confiscated (2 rifles and one slingshot), plus 19 pieces of ammunition, and 11 dead lemurs, including 9 Indri Indri (the Indri) and one Propithecus diadema (diademed sifaka). Both species are categorized as Critically Endangered by the IUCN Red List and are one of the greatest reasons for the large presence of tourists, internationals and Malagasy in the area. These species are also incredibly fascinating. For example, the Indri Indri is the largest living lemur species. About 2000 years ago, there were even larger lemurs, about the size of a gorilla. 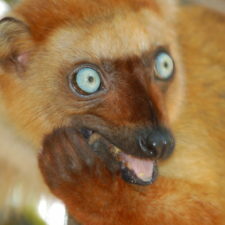 These lemurs became extinct because of poaching and deforestation by the early inhabitants of Madagascar . The poaching occured in the Antavolobe forest, which is run and managed by a grassroots community group named VOI Firaisankina. This makes the incident extremely disappointing because the man caught is known to be the Vice-President of the Federation of all VOI groups in the region. The guns belonged to a current authority of the region, who is a relative of the poacher. It is very alarming that those who should protect the conservation areas and its species are the ones damaging them. 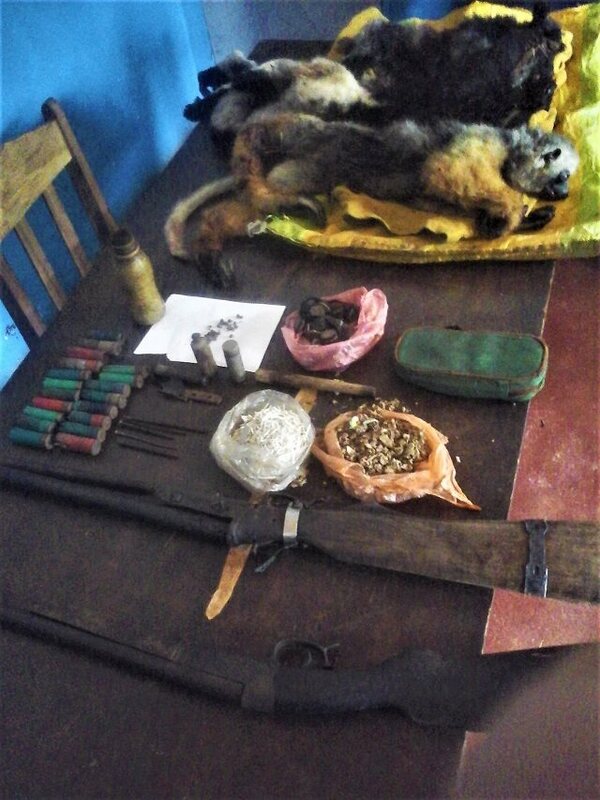 And even more alarming is that cases such as this in Madagascar are common and this lemur massacre in the Anatavolobe forest hasn’t been the biggest case of lemur poaching of the island. This situation reflects perfectly the social and cultural challenges that Madagascar and the conservation community confronts. This lemur poaching case has created such impact in Madagascar and even at the international level, that people are demanding action and justice. 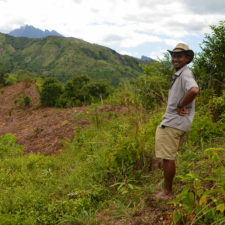 Jonah Ratsimbazafy, the Vice President of the IUCN Primate Specialist Group Madagascar and President of GERP Madagascar, has written an open letter to the Minister of the Environment, Ecology and Forests of the island to demand urgent action regarding the poaching of lemurs in the National Parks of Madagascar. In your role as Minister and therefore first person responsible for leading conservation and environmental protection in Madagascar and for enforcing the laws concerning it, we would like to respectfully use this letter and our platform to make a call to action. We feel that we are responsible for leading the call to action, and it is therefore with respect and honor that we request swift and decisive action to be taken in regards to this situation. This situation and others like it damage Madagascar’s image to the world, and could possibly have a negative impact on tourism in Madagascar, which is one of the sectors that provides income and prosperity for so many Malagasy families. Madagascar’s lemurs make up an astounding 20% of all primate species in the world, a fact even more impressive when we consider the tiny surface area of Madagascar in relation to the rest of the world. 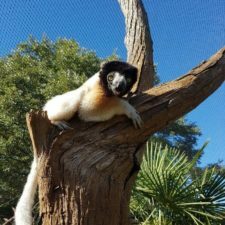 Lemurs are Madagascar’s Panda, they are the goose that laid the golden egg that attract and will attract tourists and nature lovers to our country as long as they are still here. Ironically a few days after this lemur massacre, World Wildlife Day was celebrated internationally. As citizens of the world, we have the duty to protect lemurs and do something to avoid these kind of attacks. The general increase of extraction and trafficking of wildlife within Madagascar and internationally makes it urgent and necessary to join forces from all over the world to end wildlife crime. Talk about wildlife crime with your family, friends, and everyone you can. Support NGOs and organizations that work for the conservation of species and ecosystems. Demand that governments take action to prevent and punish these attacks. People all over the world care for Madagascar and its lemurs. Christoph Schwitzer, Ph.D. He is the Director of Conservation at the Bristol Zoological Society and Vice President of the Association Européenne pour l’Etude et la Conservation des Lémuriens. As a Malagasy Citizen, I am devastated by what happened in the Antavolobe Forest, which is boarding Andasibe Madagascar National Park. When I saw the poaching of lemurs in the region was widely shared on social media, I was very frustrated because lemurs are the heritage value of my country. This situation damages Madagascar’s image to the world. We should act to stop the hunting of lemurs and the Malagasy government should take their responsibility. But, as far as we know, this hasn’t been the case! And the situation is so disheartening when we know that the poacher is among the leaders in charge of ensuring lemur conservation in the area near the villages and local communities. I hope the government will ensure that justice is served and the law is enforced. And the most important thing is that it’s urgent to educate and raise awareness among Malagasy citizens so they know that lemurs are their richness and their heritage. That’s why I hope that the action is taken to ensure education and awareness for local people. 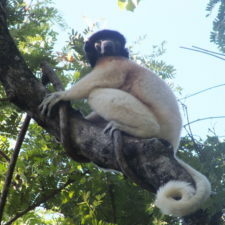 The killing of nine indri and two diademed sifakas is an appalling crime. It is an international crime and especially a crime against the people of Madagascar for whom these wonderful animals are both a cultural heritage and a great economic resource. 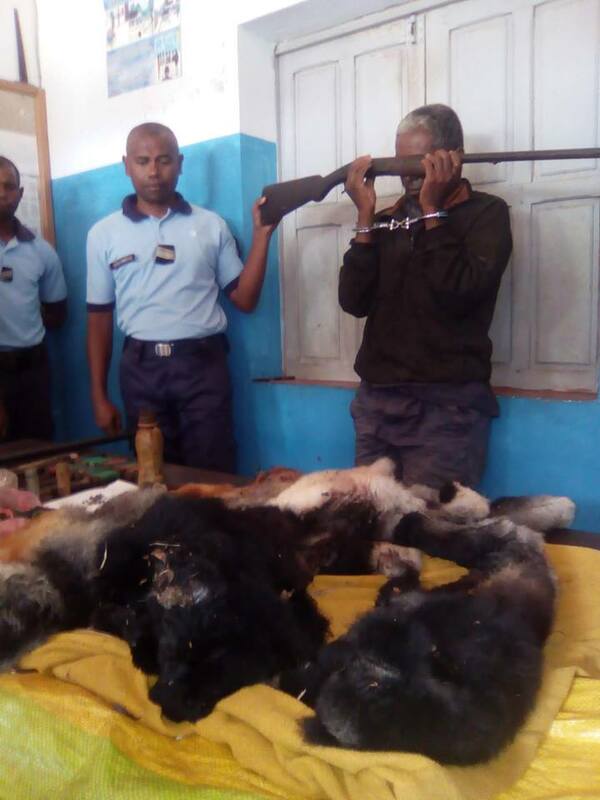 This is equivalent to the killing of a giant panda in China where the likely sentence for the poacher would be life imprisonment This case needs to be dealt with quickly and with the maximum sentence possible under MADAGASCAR law. The world is watching! Marni La Fleur, PhD. She is the founder and director of Lemur Love, Inc.
We shared the news Lemur Love‘s Facebook page and noted that people expressed both sadness and anger. Additionally, sentiments of comments suggest that people believe that although lemurs such as indri and sifaka belong to Madagascar, they are a global treasure, and the whole word suffers when they are killed. A couple of people also noted that actual punishments are unlikely given the corruption and problems with enforcement of environmental crime in Madagascar. Rainer Dolch, PhD. He is the Senior Coordinator of Association Mitsinjo, which is based in the region where this poaching incident happened. The sight and the stench of the lifeless cadavers is devastating, as the protection of these lemurs is the very concern of our association’s work in the region. Having started as a grassroots initiative at the turn of the century, Association Mitsinjo has now evolved into a community-based conservation organization of regional importance and focusing its conservation efforts on the biodiversity of Andasibe Commune and neighbouring climes. The reaction of Andasibe’s inhabitants to this heinous crime is both admirable and encouraging. Everybody condemns this act as an attack not only on local wildlife and development, but also on their pride and the very identity of Andasibe. People’s comments on social media overflow of shock, disgust and disdain for what has happened. The overwhelming majority of Andasibe’s inhabitants have fully identified with “their” lemurs and can not endure the thought that lemurs are harmed or even killed. This is especially true for the Indri which is Andasibe’s emblematic mascot. While the Malagasy name for the species, babakoto, is still used as a swearword by most of their compatriots, the people of Andasibe are immensely proud of their Indri. Many people use the Indri call as their cell phone ringtone and the local radio station, Radio Vahiniala, has made an Indri call its theme tune. Every year, Andasibe reveres its favourite animal with the Indri Festival, which is co-organized by Mitsinjo. Rainer Dolch has a lot to say about this poaching incident and his perspective is not to be missed. In next week’s blog post on the Lemur Conservation Network, you will read how this affects Andasibe, what it all means, and what Association Mitsinjo does to protect lemurs and their ecosystem in Andasibe.